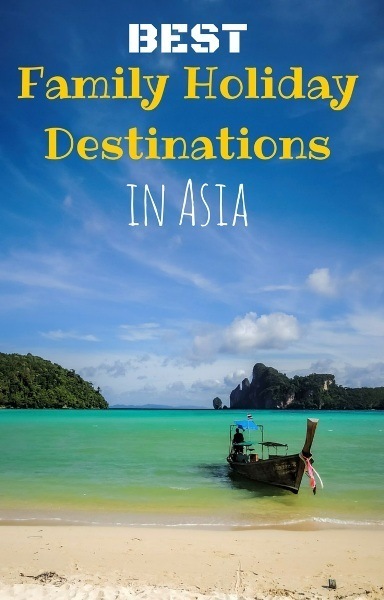 The 7 Best Family Holiday Destinations in Asia! So you want to take a family holiday in Asia? Great choice! Asia is awesome for families. There is so much to discover and experience, and mostly at a very good price! We love travelling and living in Asia from the beautiful food in Penang to the beautiful villas in bali to the adventure in the Phillipines. However, if you are anything like us, choosing a specific destination in Asia is hard! There are so many great family holiday destinations. 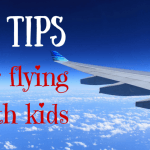 We love it here in Malaysia, but we have also loved it with kids in Bali, Singapore, Thailand, Taiwan and the Phillippines – and I am sure this list will grow as we travel to more Asian destinations as a family. What’s better than introducing your little global citizen to a foreign country? Showing them one that’s a mix of different cultures all living and working together harmoniously. Malaysia is a centuries-old combination of Malay, Chinese, Indian, and British traditions. The kids can simultaneously watch incense waft up from the front of a Chinese temple, hear the call to prayer from the mosque down the street, and smell the inviting aroma of Indian food from the cart on the corner. It’s like visiting multiple countries all at one time. Malaysia appeals to the adventurous explorer in kids. Trek the jungle in search of the distinctive Rafflesia flower which can grow up to 100 cm wide and is famous for smelling like rotten meat. In Malaysian Borneo, come face-to-face with semi-wild orangutans in rehabilitation sanctuaries or cruise rivers in search of endangered proboscis monkeys and river dolphins. Visit cultural villages to learn about now-forbidden tribal ways like headhunting, and let the kids try out how well they do with a blow dart. In Kuala Lumpur, climb 272 steps to the Hindu temple built high up inside Batu Caves. Children who enjoy modern sights will want to head up to the Skybridge of the Petronas Towers, the tallest twin towers in the world. If that isn’t enough, spend a day or two at LEGOLAND Malaysia, just across the border from Singapore. The water park, themed hotel, and amusement park rides will undoubtedly keep them entertained. Make sure to leave time to wander through Miniland Asia with models of everything from China’s Forbidden City to Cambodia’s Angkor Wat, all built out of LEGOs. 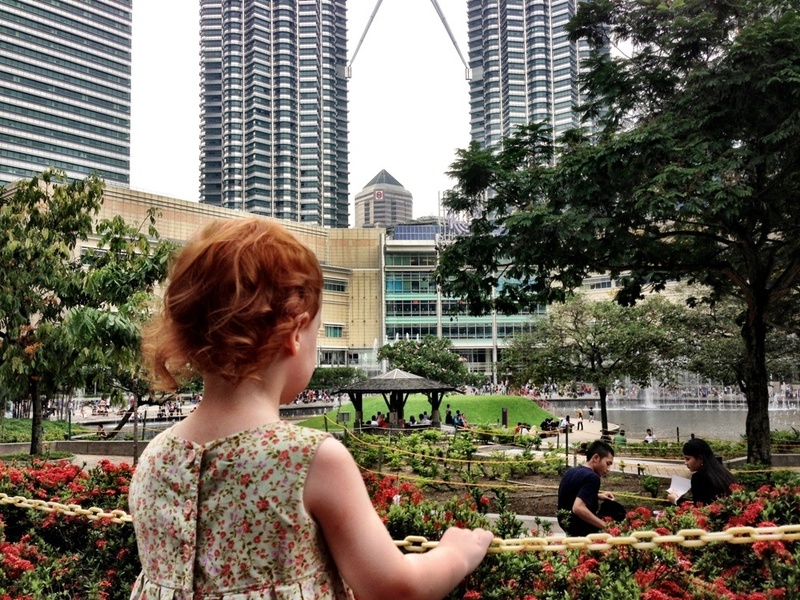 With a visit to Malaysia, your kids will feel like they’ve travelled to more than just one country. You can also read all our articles about family travel in Malaysia. I think Hong Kong is the best Asian city to take kids. My reason for this is that transport is fantastic and it is very easy to get around. The MTR (train system) is user friendly and you can get everywhere you want to go. Octopus Cards for this service can be purchased at the airport and any money will be refunded when you leave. English is widely spoken and understood in Hong Kong. You will always find someone that understands and is able to help. The locals love western children and go out of their way to make the kids feel welcome. Feeding the fussiest kids is also easy in Hong Kong. There are plenty of places to eat including all the western take away outlets we are used to and my kids ate traditional Chinese dumplings at least once a day. There is no issues with food – you are able to eat anywhere unlike a lot of other Asian countries. Hong Kong has Disneyland and Ocean Park among many other attractions that will keep the kids entertained. Disneyland is focused on the under 10’s while Ocean Park is more suitable for teenagers but young kids will also love the animals and many of the rides. Both Disneyland and Ocean Park are very affordable in Hong Kong, easy to get to on public transport and the kids loved every minute of it. Shopping is also fantastic, from markets to prestige labels, it’s all there. Make sure you barter hard in the markets though – it’s a competitive sport! I can’t recommend Hong Kong highly enough to people with young kids. If you want a stress free, easy holiday in Asia this is the place for you. 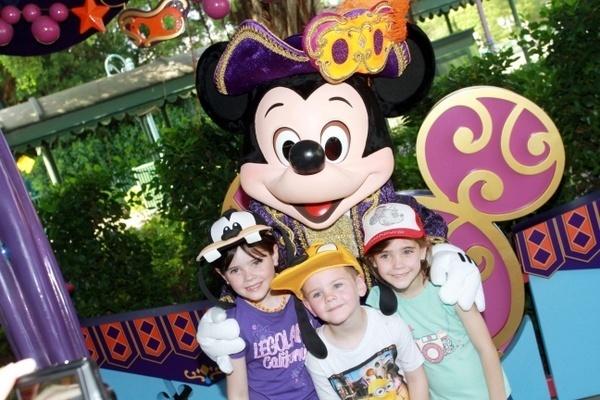 You can also read Sally’s article about things to do in Hong Kong with kids. One of our favourite Asian destinations is China. After falling in love with the country 8 years ago on a business trip, it was a must to do with the children. We returned for 2 weeks in 2013. China provides something for every one, with its rich heritage, diverse culture, exotic food and great shopping. It truly is an amazing destination to visit with kids. We visited 3 destinations, but Xi’an was definitely a highlight. This ancient city is amazing and our children loved cycling on the ancient City Wall. The wall completely encircles the old city, so the scenery from the top is incredible. 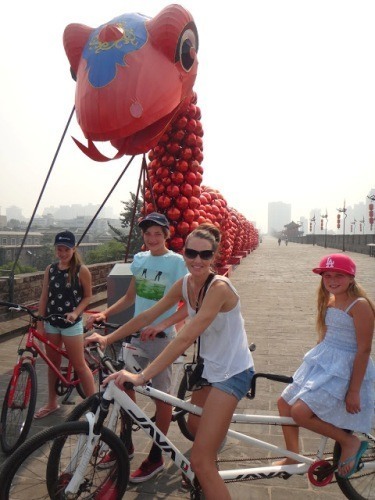 Your kids will love cycling on this 14 kilometre long wall which provides great views of the city below. Bikes and tandem bikes are available for you to rent, and on each corner you can take a rest and enjoy an icy-pole or replenish with a nice cold bottle of water, as it was super hot when we visited in July. If your children are not old enough to ride the bicycles, there are also electric cars to hire. Trust me. Your Children will absolutely LOVE this activity! We love Japan and have visited a couple of times with kids. We feel there are many reasons it is the best Asian country to visit with kids. Japan is a year-round destination with a beautiful, varied landscape. It is clean, safe and has one of the most efficient public transportation systems that will take visitors throughout the country via the shinkasen or bullet trains. Japan is a blend of modern and old world. Tokyo offers the most innovative technologies and skyscrapers while Kyoto is old Japan at its finest with over 2,000 temples and shrines. It’s a country rich in history and culture and also has some of the most polite and helpful people we’ve ever met. Japan has countless family-friendly attractions and activities from parks, gardens, museums, castles and even temples for some cultural immersions. Some attractions are quite unique like watching sumo wrestling tournaments, seeing Mt. Fuji, visiting a Hello Kitty park or jumping on the cat bus at the Studio Ghibli Museum. It also has many amusement parks including Tokyo Disneyland, Tokyo DisneySea, Universal Studios and Space World that can entertain families for days. DisneySea is one of the best parks we have ever visited. Travel Tips: We found traveling in Japan quite easy. Eat at the department stores’ basement halls for a variety of fresh and cheaper food. There’s bound to be something there even for picky eaters. Items are discounted near closing time. If you’re going to be traveling all over Japan, get the Japan Rail Pass for major cost-savings that allows unlimited travel on trains and buses on the Japan Railways networks. Kids under 5 years old are free. Read more about Japan in our Japan section! Laos was a great country to travel in with children. We loved it for the culture and the people, who were friendly and generous. However, mostly we loved it for the incredible nature and opportunities to always be outside. We spent our days riding the scooter around rice patties, exploring small villages, caves, and stunning blue lagoons. We then spent our evenings out at one of the relaxed restaurants/bars where the food was yummy, inexpensive, and actually quite varied. 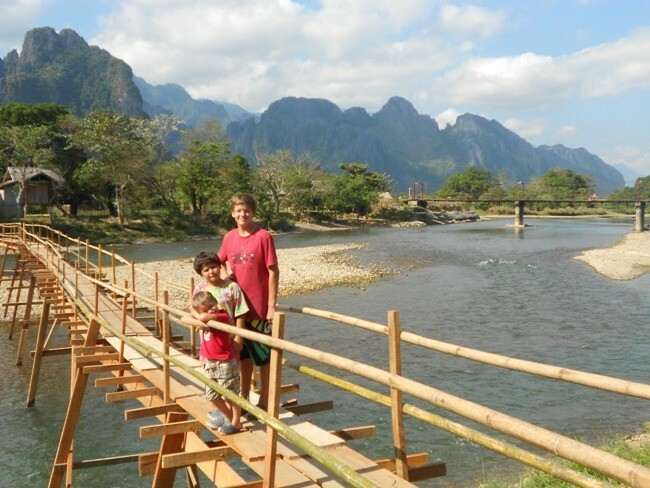 Travel Tip: One thing you should be sure to do is hit Vang Vieng! Many people think it is just a party town and when you first arrive you may sense that is all it is as well, but give it a couple days and get out exploring! Even the tubing is great fun for kids of all ages. What an impossible question! It, of course, depends on the age of kids. With babies & prams I would choose Kuala Lumpar in Malaysia. There are good, stable paths so getting around is much easier. But we have been taking our kids to Bali, Indonesia since they were in my tummy. Bali has so many wonderful qualities. 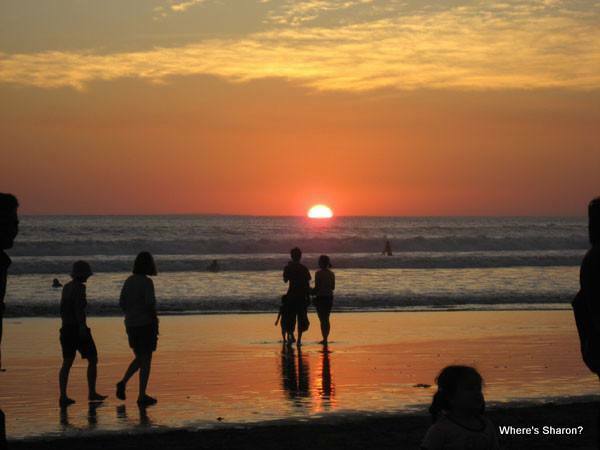 From the perfect weather in every season, to the friendly Balinese who absolutely adore children. The price is cheap so you can have a luxurious vacation for a reasonable price and there are so many activities to do from water parks to monkey forests to shows. Travel Tip: The Balinese are super friendly so don’t be worried when they take your kids for a walk while you are at a restaurant. They are not kidnapping them. They are simply entertaining them so you can eat in peace. It’s a novel idea, but certainly a very welcome one. 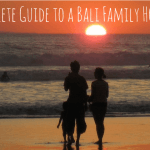 Read our guide to travelling in Bali with kids. My (Sharon again!) 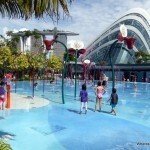 top family holiday destination in Asia has to be Singapore. It is just perfect for families with kids of all ages. It has everything I look for in a destination – interesting culture, easy to get around, great food, many and varied attractions. The mix of Malay, Indian and Chinese cultures is apparent and adds to the appeal of Singapore – as well as the taste! There is also a strong British influence and many expats to give it a very multicultural vibe. The common language is English and you will see this everywhere which makes things extra easy. The subway system is unreal. Efficient and thorough and will take you to most destinations. As for attractions there are many! 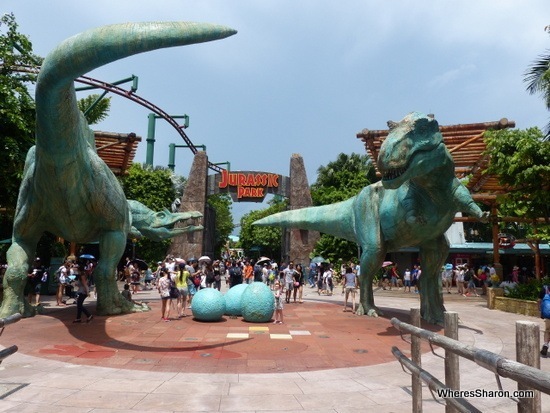 We particularly loved Universal Studios Singapore, and there are also water parks, the world’s largest aquarium, a fabulous zoo and many cultural attractions as well. You could spend weeks here and not run out of new things to do. The only downside is the cost, Singapore is not cheap. Travel Tips: Bring plenty of money, do not expect it to be comparable in cost to the neighbouring countries. Try lots of food and get to some hawker centres. 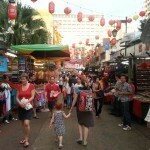 You can read more about family travel in Singapore and our huge in depth guide to visiting Singapore with kids. Hopefully this list has helped you narrow down your Asian family holiday destination and doesn’t have you more confused! There are certainly many great places to visit on the world’s largest continent and I don’t think you can go wrong whichever one you choose! What is your favourite family destination in Asia? You can also read our articles which focus on the best holiday destinations in the world, Europe, the Pacific and the Caribbean. 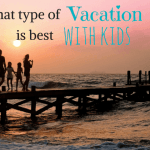 What type of vacation is best with young kids? What a great list, Sharon! I learned quite a bit here and added some new places to our growing list. Thanks for including us! We hope you’ll enjoy Japan as much as we did. Yes I am not sure if this list is really a good way to help you decide on a destination or just a way to grow your bucket list! 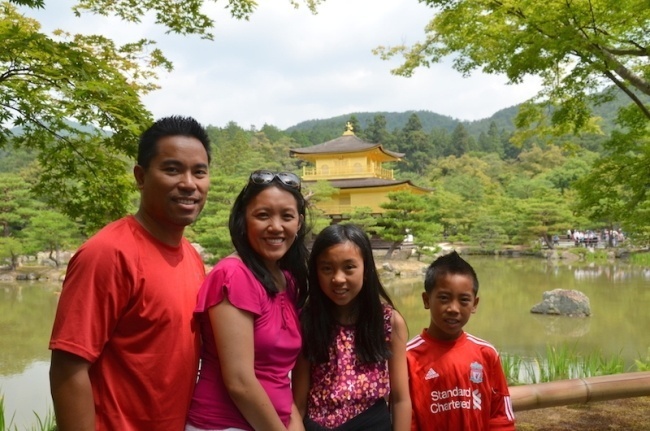 I think we will love Japan – I did on my previous visits before kids. I wish an airline would hurry up and have a decent sale! I loved seeing some of my fav bloggers here sharing their travels! We plan on both Laos this March and Bali( Ubud) in November. Japan is on our list too and China….honestly my list includes pretty much anywhere and everywhere! Lol yeah my list is much the same. Sounds like an exciting year for your family! There are just too many great places to go. Great list! I always think its best to get the opinion of families that have actually traveled there! Thanks for including us! Sharon, I agree with all of them. Great desinations for a family! Thank you so much for your helpful comment, April. I had the same experience in Singapore when I went when the kids were younger and totally forgot. I remember it being quite painful on a longer train ride as my kids also love to eat and drink regularly. We had the same experience in Taiwan. Very annoying!! What do you think the minimum age for kids travelling to some of these spots should be? I’m especially interested in Laos. Hi Mel! I would take my kids to any of the countries on this list probably from about 6 months old – not that I think younger would be bad for them, just I would not like to travel in the newborn fog. I have not been to Laos since having kids (I went before), but I would take them there. I would probably keep to the main destinations just because I don’t think rough travel would agree with us all yet, but we went Luang Prabang – Vang Vieng – Vientiane and it was all very easy. We took our kids to Singapore, Thailand, Malaysia, Taiwan and the Philippines on a 7 week extravaganza when they were 2 and turning 1 (Z turned 1 in the Philippines!) and had an awesome time. I 100% agree with you that Singapore, we absolutely love it. We just came back from there and we are now looking to find the next family adventure, we are worried that the others won’t compare. I have travelled to the other places on your list before kids so I never looked at family based activities when I was there. What are your thoughts on the Phillipines with kids and also are there any must do activities that you could recommend? Thanks again for the great list. Hi Tania! That’s great that you loved Singapore too 🙂 We loved travelling to the Philippines (more here if you haven’t seen it), so much that we plan to go back later this year. I personally did not experience any must do activities there with kids. It was more that it was a nice and easy place to hang out and have fun. It is very cheap, except on BOracay, but we did love Boracay. We found getting around reasonably easy. It was easy to get hotels with pools so the kids had that and there is some great seafood! We are looking forward to exploring Bohol next. I believe there are whale sharks there which is something that has been on my bucket list for a long time. I love Asia………so many wonderful things to see and experience……I have been to China and Japan and I really loved my time……excellent family friendly destinations…. Coolest destinations ever! Cant wait to be there soon. Thanks for giving us these travel choices! Great list. We’ve been to Hong Kong, Japan and Bali. I’d really love to take the kids to China — such a rich culture and oh the food! We have flights to China next month actually!! Unfortunately, we won’t be using them though 🙁 Booked them before we found out we were expecting a June baby!! Oh well, I am sure we will get back there soon enough – great place! love all your notes on your trips with family…we’re seriously considering malaysia-indonesia this dec 2016. Looking forward and thank you all for your inputs. Thank you for this list! Been searching for family friendly destinations in Asia and these are very good suggestions. Been itching to travel outside Australia, and Asia seems like an ideal place to start! Thanks Sharon! Ow I am deeply touched when you said that you think the Balinese are absolutely adoring children. Thank you so much. And as a person who also has been in Bali since I was in the womb, I really agree if Bali does have so many unique things. Sea? Mountain ? Beach ? Waterfall ? Good Waves ? Jungle ? you can find all of that spot in Bali. It’s perfect to bring your family on vacation to Bali. For accommodation, don’t worry, visit our website! Even for a luxury villa with 5 rooms yet affordable price, We provide it! Must Say thank you for sharing amazing kids holidays destination in Asia… looking forward to making my next travel list.